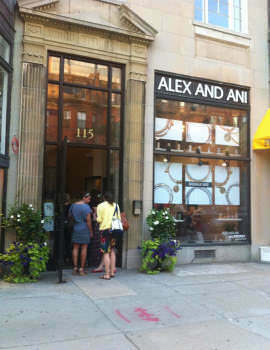 Alex and Ani, LLC. offers eco-friendly, positive energy products that adorn the body, enlighten the mind, and empower the spirit, designed by Carolyn Rafaelian and made in America. Rafaelian believes that every individual has a positive message to share with the world and by incorporating powerful symbolism and infusing (+) energy into each piece, Alex and Ani provides a vehicle for the wearer to express their individuality in an organic, spiritual way. Carolyn believes it is her life's work to inspire her customers to relish what is unique and authentic about themselves, drawing out the beauty that resides within.